This unique new guide to New York dispenses with boring lists and dry descriptions and instead invites the user to discover different facets of the city through a series of fifty highly original, entertaining themed maps. 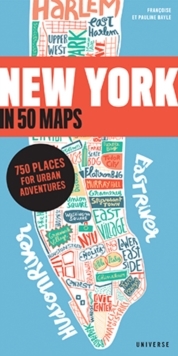 Each of these inventive maps is illustrated in full colour on subjects that range from the lighthearted (Famous Movie Locations) and whimsical (Where to Lose Your Children) to classic tourist itineraries (How to Find Manhattan Neighborhoods). The book includes something for everyone, from a map of the best spots to take a selfie to the landmarks of hip-hop. Some maps focus on the practical or exotic, while others reveal the city's forgotten or little-known corners. Taken together, the fifty maps create an extensive and exciting alternative to traditional guides. Contributing illustrators who were commissioned to create a map for this book include some well-known as well as up-and-coming illustrators: Jean Jullien, Gianpaolo Pagni, Chloe Poizat, Christian Roux, and Quentin Vijoux.